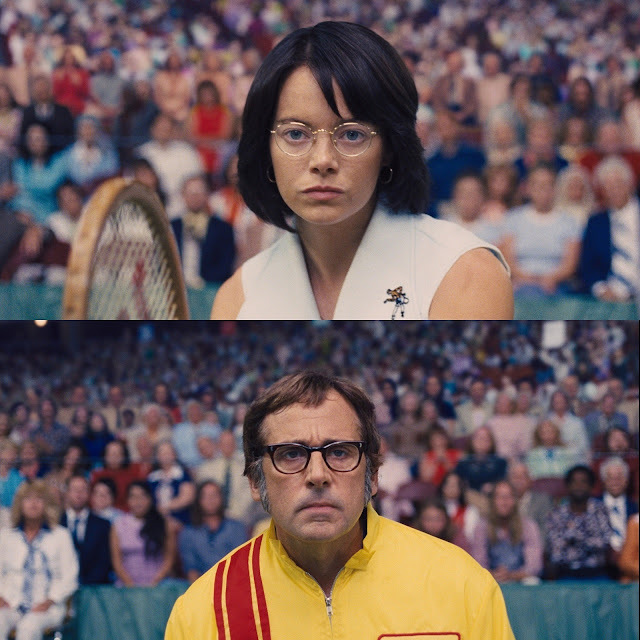 Emma Stone and Steve Carell star in the exciting and moving new film “Battle of the Sexes,” which is based on true events and revolves around tennis legend Billie Jean King’s historic 1973 match against Bobby Riggs. Oscar winner Emma Stone stars as King; Oscar nominee Steve Carell plays Riggs, the former champion who claimed that no woman would ever defeat him. The electrifying contest was viewed by millions worldwide. The film, from directors Valerie Faris and Jonathan Dayton, is heartfelt and infused with humor, relating the personal journeys of both players. It delivers insights into Billie Jean King’s pioneering achievements as well as her challenges, as she was coming to terms with her sexuality, while preparing for the match. “Women belong in the bedroom and the kitchen,” declared former tennis champion Bobby Riggs, delivering a wildly controversial challenge to Billie Jean King, who dominated tennis in the 70s, with the assertion that no woman, not even the best, would have the strength and skill to defeat him. The outrageous comments from the 55-year-old former champion provoked an immediate backlash. King, 29, decided to accept the challenge and the battle got underway. To some degree, observes Carell, the caricature of a bad boy that Riggs was presenting to the world began to consume him. “All this money and instant celebrity was being thrown at him but it was a double-edged sword because at the same time the fame was not really for who he was but for this persona he was playing. People forgot he was a serious athlete and I think that hurt him,” Carell says. Together, Billie and Bobby served up a cultural spectacle that resonated far beyond the tennis court, sparking discussions in bedrooms and boardrooms that continue to reverberate today. "Battle of the Sexes" is also the featured closing feature film (November 28) in this year's Cinema One Originals.